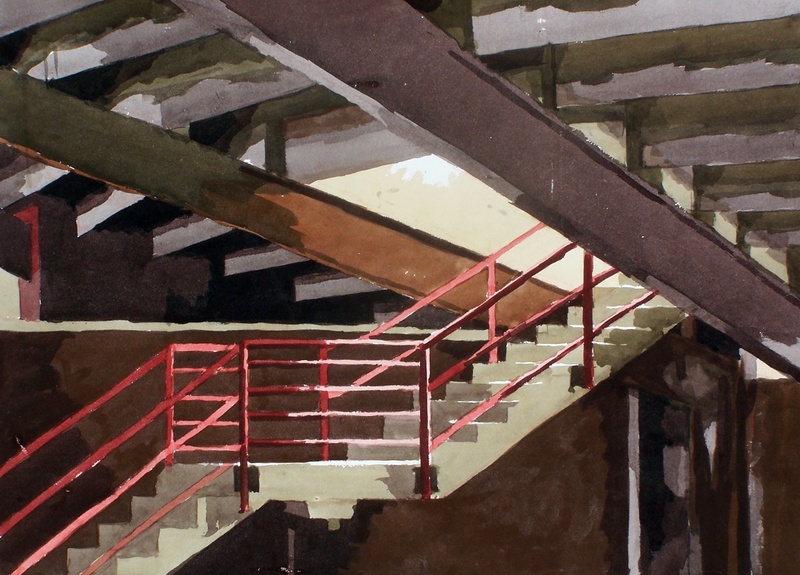 Painting of the decaying Moorabbin stands by David Hurwitz. 1965: a watershed year for the Victorian Football League. It can be argued that this year was the birth of the modern game. Barassi threw the long held ideal of loyalty into disarray, while three teams vacated their traditional homes in search of greener pastures. 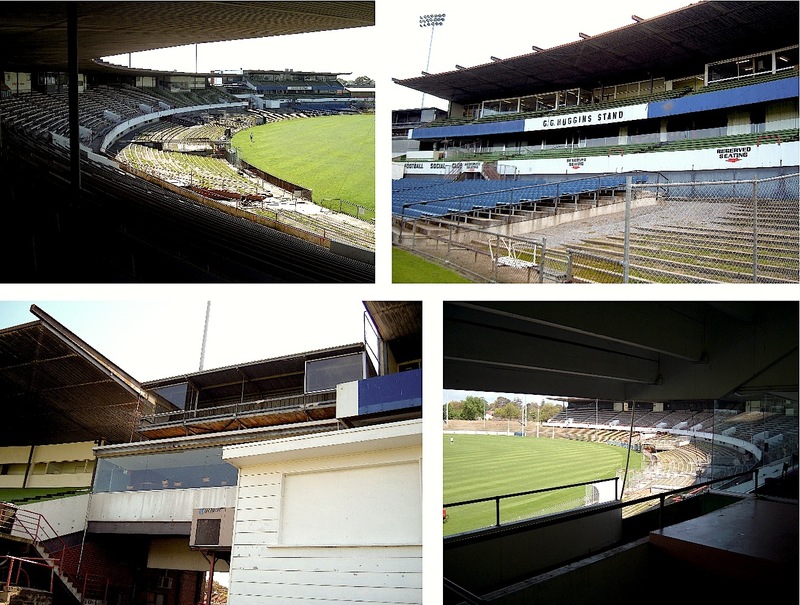 While North’s venture to VFA side Coburg’s ‘City Oval’ was short lived, Richmond’s move to the MCG propelled it to it’s most successful period, as did St.Kilda’s move from their home by the sea to Moorabbin, another VFA ground taken over by a league club, another glimpse into the future. 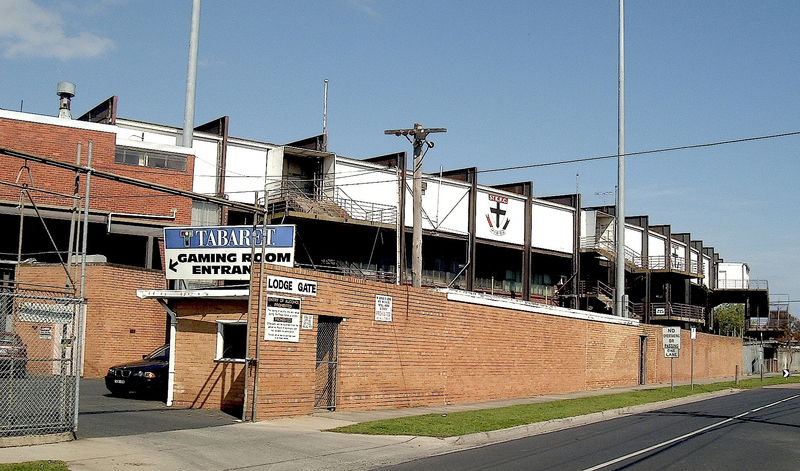 The Moorabbin Football Ground was previously home to VFA team the Moorabbin Kangaroos. Cutting a long story short, St.Kilda saw that the south east of Melbourne was in effect, unclaimed territory, and decided upon the shift. Though the move to Moorabbin brought with it heartache, all was quickly forgotten as St.Kilda made back-to-back-back grand finals, winning their one and only flag in 1966. 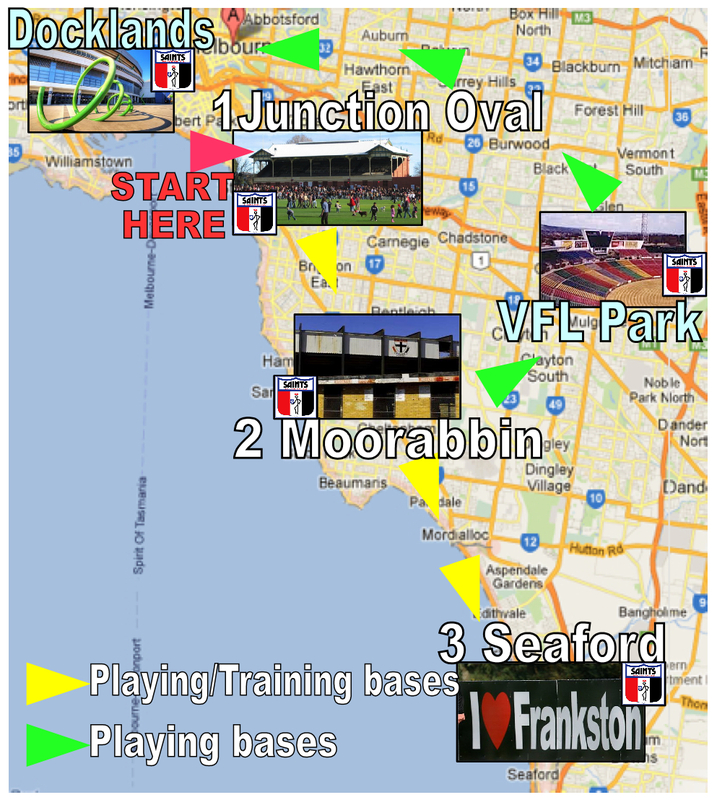 You can track St.Kilda F.C’s movement’s in the below diagram I put together. 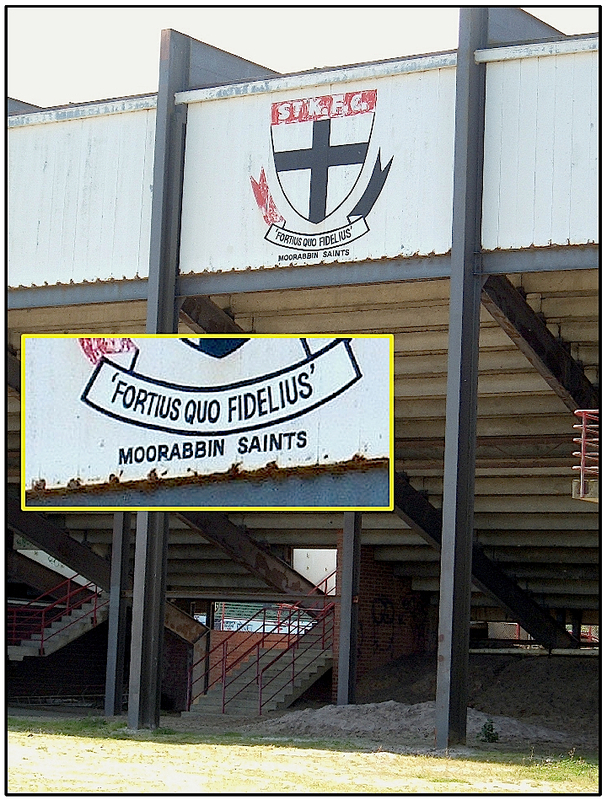 As you can see from the recently demolished stands at Moorabbin, the intention appears to have been to gradually morph St.Kilda into the Moorabbin Football Club, but this clearly never eventuated. Whilst the ground’s league lifespan was short, less than 30 years, it truly found a place in the heart of St.Kilda fans. Though not quite to the level which Victoria Park has entered football folklore, Moorabbin has still spawned it’s fair share of paintings and literature, holding a certain dreamtime quality for fans of the red white and black. 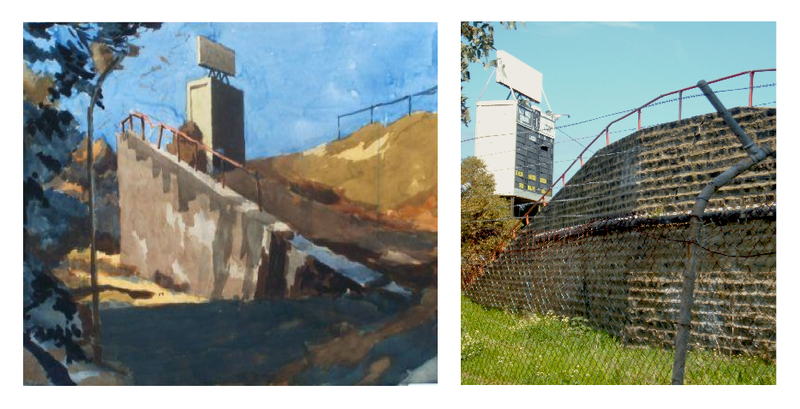 On the left is another painting from David Hurwitz, painted in a very similar position to which I took the photo on the right! Great minds think alike I guess. This is a collection of pictures I took of the ground in 2006, in a desperate bid to photographically archive all the old league grounds in Melbourne. As it turns out, much of what I captured has since been demolished, and many links to the past now gone. It seems a number of footy fans shared my vision, and some of their photos and paintings have helped shape this post. My dad always said that Moorabbin seemed odd to him as it jutted out of the south-eastern suburbs of Melbourne; most other grounds were flanked by old hotels, old train stations and old terrace houses. Moorabbin was surrounded by the cream brick veneer housing of an ever-expanding city. As I circled the ground before entering, I snapped one of the old entrance gates. On closer inspection, it became quite clear that it was occupied, and though I was keen to document all that I could, I decided to continue on. And what this above photo makes me realise? That modern football stadia is severely lacking in barbed wire! As I entered the ground from the Linton St side, I couldn’t help but catch a glimpse of St.Kilda’s gymnasium of the time. 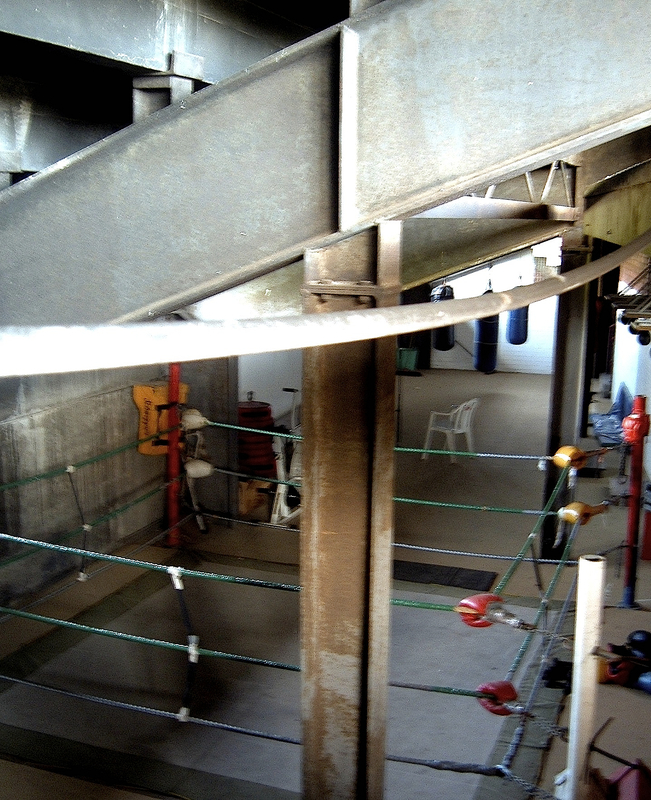 Even though this was six or so years ago, it was severely behind other clubs and their advanced setups. This was open to the elements! What struck me about Moorabbin was the size. The stand which stretched from the wing to behind the goals (below) was very large for a suburban ground, and the terraced outer was rather expansive. 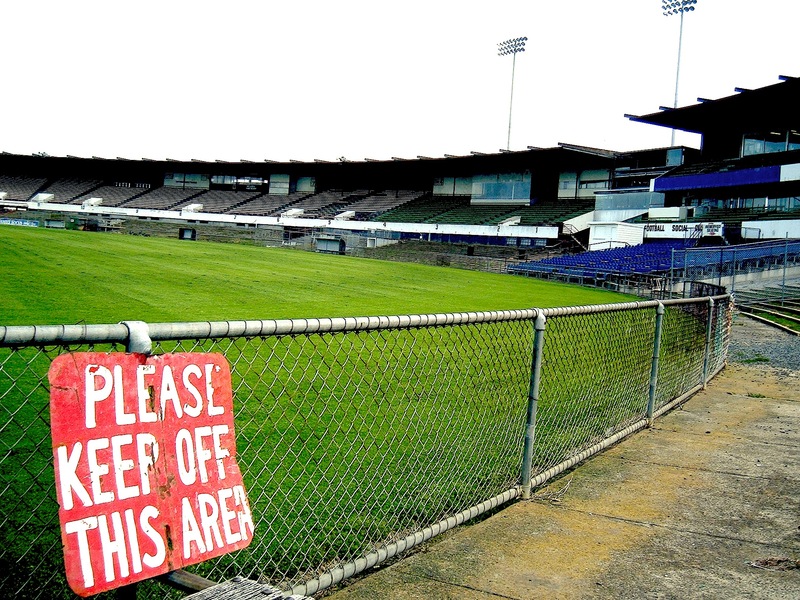 It begs the question of why the club actually moved to Waverley Park in 1993. Geelong’s Kardinia Park is nearly three quarters through a long-term redevelopment, the club reaping the benefits of being able to sell reserved-seat tickets to their matches. It is a shame that a ground such as Moorabbin has not shared the same fate. The grandstand offered plenty of cover and very good views. However, the photo at the bottom left is what I love about the old footy grounds…if you needed a coaches box, you built it on top of the stand, creating a haphazard atmosphere which brought with it great character. A combination of weatherboard, tin, steel and brick! 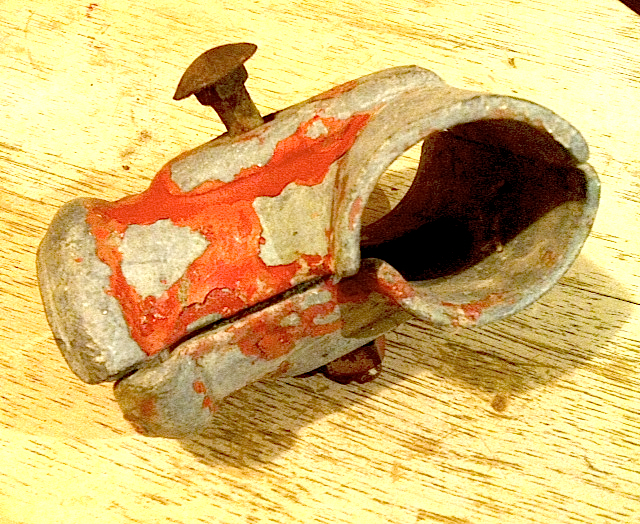 On my explorations, I found my own bit of Moorabbin to take home with me, 2 inch tubular fencing tee piece coupling, with red paint peeling. This was well captured again by Hurwitz’s painting on the left. 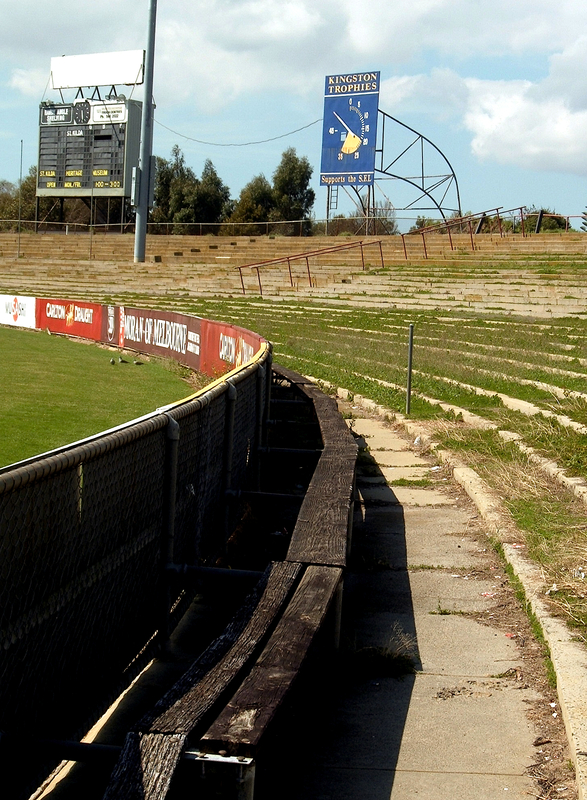 Here’s the outer side of the Moorabbin footy ground; the wooden seats on the fence for those early enough, looked down upon by the now demolished scoreboard and timeclock. 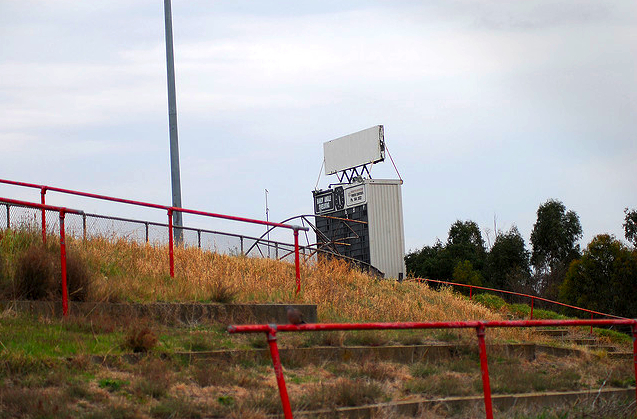 In a great piece on the Moorabbin scoreboard, Vin Maskell looks at it’s history, and where portions of it are now scattered! Old footy grounds were not just protected by barbed wire. Officious and over-zealous signage adorned many on old venue, and it’s hard to imagine it not been written by a gnarly old stallwart. Consider the following examples…the second is from the collection of Tim Best, a Saint fan who used to sell the footy record outside the ground! 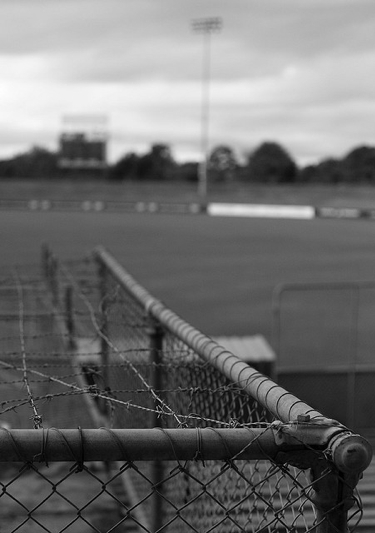 And what post on Moorabbin would be complete without at least a view from one of the most notoriously vicious and parochial patches of terracing Australian Football has know, the old Animal Enclosure. The name says it all, it was not for the feint-hearted! Here’s a wonderful piece on the Animal closure by Paul Daffey. Photograph by Tim Best. 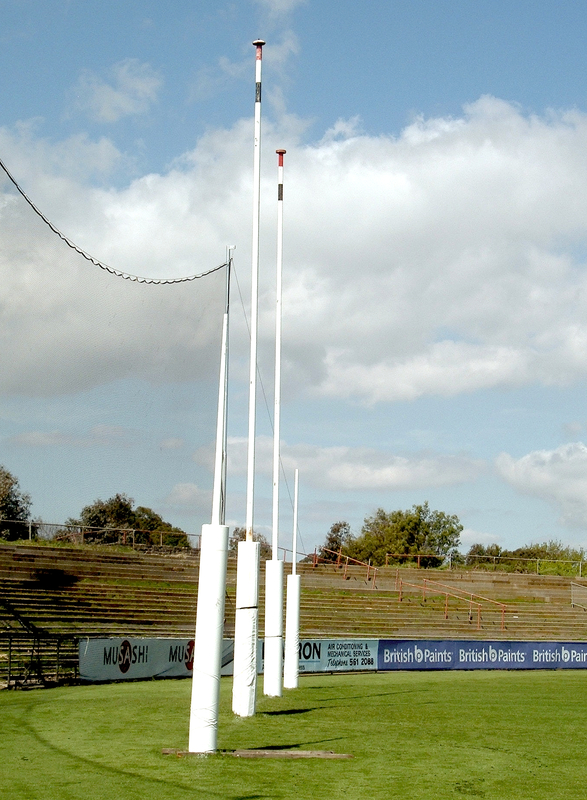 For more of his photographic take on Moorabbin Oval, click HERE. While the Saints now train at the Seaford version of Linen House Oval (I liked how ‘Linen’ was so close to ‘Linton’) they still maintain a presence at Moorabbin. 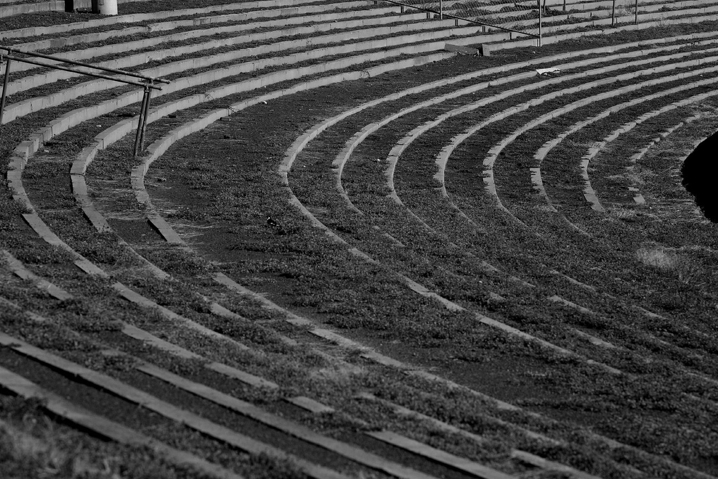 Only the Huggins stand remains, yet where terraces and stands once stood, there are now grassy embankments, maintaining the feel of how it once was. 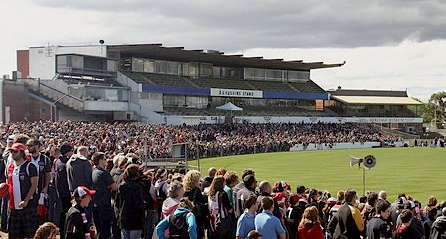 With light towers erected for baseball in the 1990’s, Football Victoria could do worse than considering it as a home for VFL football, however I can’t see this eventuating. The Saints now play at the Docklands, which is far closer to their birthplace, St.Kilda, than Moorabbin, Waverley and Seaford combined. Yet a ‘home ground’ in Melbourne is nothing more than a token gesture these days, and nothing will match the days at the Junction and then Moorabbin. But that’s progress, progress which can be traced back to the Saints pioneering move to Moorabbin in the first place. Leaving wasn’t easy in 1992. There was much supporter angst, yet to no avail. Again consider the words of Matthew Hardy when it came to the last match at the ground in 1992. And here’s a great clip from the last day at the ground. All photographs by John Carr unless otherwise stated. This entry was posted in Home & Away and tagged 1965, afl, Animal Enclosure, Australian Football, Footy, Jeff Fehring, Junction Oval, lights, Melbourne, Moorabbin, Moorabbin Oval, painting, Saints, Seafor, south east suburbs, st.kilda, St.Kilda football club, VFL, VFL Park, Waverlay Park by theholyboot. Bookmark the permalink. Brilliant John! What a great collection of words, photos & video footage. I think I only ever went there twice – once to see Collingwood (we won in a high scoring game) and the other playing for the Tigers in the Little League. It really was no oil painting – perhaps why your friend David looks like he used watercolours instead! Great article John. The ground holds a big part in my life. I spent a number of years, barely double digits in age, selling pies and drinks from one of the dodgy outlets under the stands. My dad used to help run the catering gig there and I still remember the sausage rolls and donuts that would come home on a Saturday night after each game that were left over. I was lucky enough to take my kids to a few of the exhibition games in the later years before they headed south for Seaford and it’s a shame it’s not something they’ll be able to do for theirs. The ground is still kept in great condition and it’s nice that it has all been opened up to the public now with all the outer cleared and grassed. Your upcoming Punt Road feature will surely be the classic of all classic Holy Boot posts. TOTALLY BRILLIANT MATE! I”M HONOURED TO GET A MENTION!